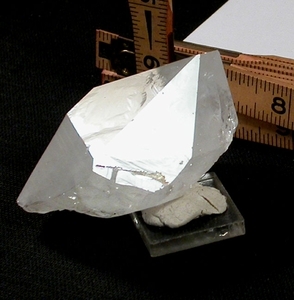 An uncommon through-and-through doubly-terminated crystal of 1/4x 1-1/4" classically penetrated its' host - this fine Arkansas extra-terrestrial crystal which multi-terminated itself in a pocket underground. This channel faced ET is also devic and feathered veiled with record keepers, barnacle crystals, and three small neon-colored irises. Small cabinet sized for comfortable hand-holding: a tabular 1-1/2x 2-1/2x 3". Winningly self-displays. Closed private mine, Hogjaw Area, Montgomery County, Arkansas.